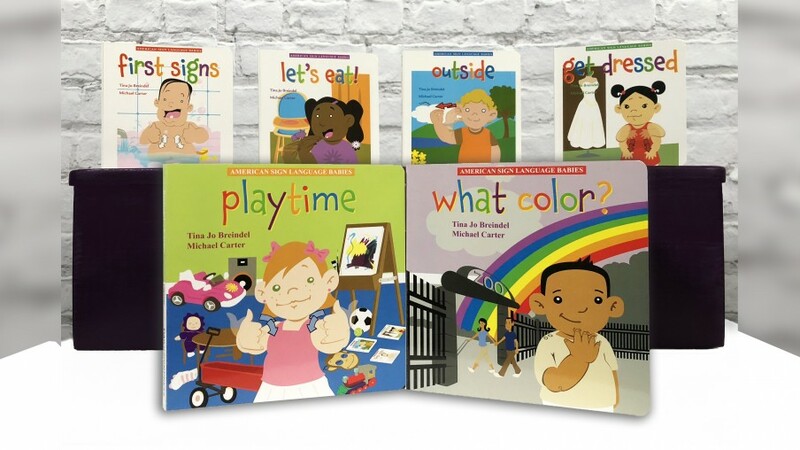 November 13, 2018, San Diego, CA- American Sign Language (ASL) Media and Publishing House, DawnSignPress has published their newest baby board books, What Color? and Playtime, adding to their renowned ASL Babies Series. Co-author and mom, Tina Jo Breindel, visually demonstrates how to sign with your baby in the free online videos that are a companion to the baby board book series found here. Ms. Breindel says: "This is a great way to cuddle and bond and by adding a book into your routine, your baby will learn that reading (and signing) is special and something to look forward to!" Dr. Laura-Ann Petitto, Cognitive Neuroscientist and a Developmental Cognitive Neuroscientist widely known for her discoveries about the brain structure underlying early human language processing says: "Children who are exposed to multiple languages actually are not delayed, they are not confused, they hit each of their classic language milestones in each of the languages on the same maturational timetable. The human brain actually is empowered and develops with agility when it's getting two languages at the same time." What Color? and Playtime add to the existing titles: First Signs, Let's Eat, Get Dressed and Outside. About DawnSignPress: DawnSignPress is a media and publishing house that creates, develops, produces, publishes and distributes quality American Sign Language (ASL) and Deaf culture-related materials. DawnSignPress is on the cutting edge of the educational, cultural, and social trends in the Deaf world. Deaf-owned and -operated, DawnSignPress produces educational materials that raise standards in ASL education, break new ground in ASL literature and the arts, and pserve the unique and rich contributions of the Deaf and signing community. For more information, visit www.dawnsign.com.